Russia hates the West and the West hates Russia. Or so it seems much of the time. All that Russian dastardliness over Ukraine for a start. From a Russian perspective, places like Ukraine and Syria have always fallen within their hegemony, and we in the West are trying to muscle in on their patch. Which is of course true. We are doing just that. In regard to Russia the scales are reversed. There is far too much emphasis on Russia’s hegemonic misdeeds which are minor in comparison to those of the West (e.g. the catastrophic Anglo-French promotion of war in Libya despite Russian misgivings). And meanwhile human rights abuses in Russia are almost utterly ignored. In Russia it is now a crime to “Deny Traditional Family Values” (an anti-gay measure). In Russia, any form of domestic abuse that does not require hospital treatment is no longer a crime. And now there are murmurs about a proposed draconian anti-abortion law to appease the Orthodox Church. We need constructive dialogue with Russia. It is in their interest and it is in our interest. Meanwhile it was extraordinary to hear British Premier Theresa May accusing Russia of interference in Western elections the other day in her Mansion House speech. We in the West were past masters at interfering in Soviet elections back in the day. We had a whole disinformation department established by my late father’s friend Lord Mayhew. It was called the IRD, or the Information Research Department. It was disbanded by Lord Owen during his tenure as Foreign Secretary in 1977. But that didn’t stop us interfering in the last Russian elections – or that at least is the Russian perception. Nor does it stop us from putting ruthless pressure on Russia even at the most petty level, such as the recent moves to freeze the Russia Today bank account in the UK by the National Westminster Bank. We need to be wiser and less petty and work together with Russia to build a safer world. Our petty politics should end. Another Cold War serves nobody. For Russia, the Middle East has historically been a region of strategic and economic importance. Russia is seen as an alternative to the Western ideological framework, granting it a special status in the area. Apart from being a consistent alternate power, Russia’s objectives and policies in the Middle East have always changed depending on its relationship with the Western powers. 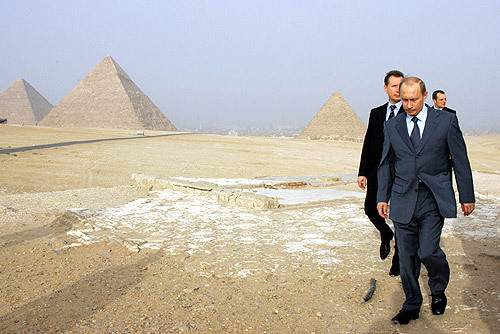 In March 2012 Vladimir Putin returned to the Russian presidency as a different figure. Seemingly more anti-Western and disappointed by the failure of Obama’s RESET policy, the Libyan crisis of 2011 and the ongoing sanctions on Iran, he is more confrontational, unpredictable and assertive in his actions with the West. Interestingly enough, this was not the case under Dmitri Medvedev’s presidency, which focused on fostering relations with the West and as a result took a more hands-off approach in the Middle East. The current U-turn originates in what Putin sees as covert Western involvement in the Arab Spring of 2011, reminiscent of the colour revolutions that were inspired by the West in post-Soviet republics. For Putin, these red flags suggest that Russia’s presence in the Middle East is necessary to protect vital spheres of influence and sustain Russia’s image as a great power. For this reason, the world faces a reinvigorated return of Russia in the Middle East, albeit a confused return. To contextualize Russia’s aims, one needs to look no further than the paramount diplomatic issue facing the country. The current crisis in Ukraine consumes almost all of Moscow’s financial, military and political capital away from the Middle East, justifying the lost long-term objective in the region. Rather than envisaging a definitive goal for Russia’s interest in the area, the agenda seems to jump from crisis to crisis. Looking at Russia’s cooperation with the Middle East on an individual basis, a pattern of cautious engagement starts to appear. Russia’s relations with the GCC countries is one that avoids politicization. Instead of condemning various monarchies on their human rights record and lack of democratic progress, Russia takes a pragmatic stance. It vehemently believes in non-interference in internal affairs and taking a position on these issues would be an unusual precedent. Establishing democracy in Qatar or Saudi Arabia is not important. In fact, this would almost certainly be disadvantageous to Russia. In Riyadh, those on the upper echelons of power are loyal to the U.S.-Saudi alliance so the recent secretive deals between high-ranking Russian and Saudi officials seem out of place. Putin and the Deputy Crown Prince, a less pro-Washington figure in the Saudi leadership, met in St. Petersburg in June 2015, indicating King Salman’s change of policy with Russia. There are unconfirmed talks of investing in the construction of nuclear power plants, increasing arms sales, and negotiating oil prices. This is understandable, considering the fact that the current Saudi leadership is disillusioned with Obama’s policy in the Middle East, especially regarding Iran, and thus aims at cementing bilateral ties with the Russian leadership. The Saudi objective is to dissuade Putin from his unwavering support of Assad, whereas Putin’s is to reduce Saudi’s overwhelming influential oil production, in order to spike global oil prices. Although Russia takes advantage of its position as an alternative power when cracks appear between Arab countries and the U.S., the recent Saudi-led bombing of Yemen, puts Russia in an awkward position. Russia’s key concern over Yemen is Saudi Arabia undermining the authority of the UN Security Council and bombing Houthi rebels in Yemen without prior authorization. Apart from lucrative trade deals and opportunism, Russia is keen on maintaining the international world order and makes enormous use of the UNSC for political leverage. In a sign of dissatisfaction, Russia abstained in a vote on UNSC Resolution 2216, a vote that Saudi Arabia heavily lobbied Russia for, which called for a withdrawal of Houthis from Sanaa. With the situation in Yemen rapidly deteriorating and the recent rise of ISIS fighters, Moscow’s concern for the Gulf area is uncommonly high. Comments from the Russian Foreign Ministry echo a need for all Yemeni political forces to start a “full-fledged national dialogue under the auspices of the UN”. The nature of the situation means that Russia is intent on keeping third-party players strictly outside the political resolution. Concerning Iran, Russia plays a balancing act due to its cordial ties with Israel. Under Putin, the current relations with Tehran suggest a positive step towards reintegrating Iran into the international arena. This is demonstrated by Russia’s decision to lift the ban on a weapons trade deal with Iran after making progress on the P5+1 talks on the Iranian nuclear programme. The sale of S-300 surface-to-air missiles goes back to 2010, but was temporarily halted due to intense lobbying by Israel and the West. Although Sergey Lavrov, the Russian Foreign Minister, emphasizes the defensive nature of the deal, the missile system can be used to shoot down jets and other missiles, increasing Iran’s capacity to subdue a threat to its nuclear facilities. This is a concern for Israel, which has been the most vocal advocate against the Iran nuclear deal and has warned of sanctions relief as a chance for Iran to engage in ‘sanctions for arms’. Another factor that Russia has in mind when dealing with Shia Iran is that twenty percent of Russia’s population is Muslim, of which ninety percent are Sunni. Keeping a delicate balance of not frustrating one side too much is a long-standing talent that Russia holds. In Tel Aviv, Russia’s relationship is more complex than the other Middle Eastern nations. This is partly due to the huge Russian émigré population. There are around one million Russian speakers in Israel, with direct economic and cultural ties to Russia and the rest of the former Soviet Union. Russian ties range from military collaboration to oil supply contracts and visa-free agreements. In the scientific sphere, Russia has numerous nuclear, space and technological agreements that it does not have with other Middle Eastern countries. In fact, the countries are so closely linked that the Russian President and the Israeli Prime Minister have encrypted communication lines to guarantee no eavesdropping. With this in mind, Russia has a stronger cultural connection to Israel than it does to any other Middle Eastern country. Moscow is also hoping to establish a long-lasting friendship that will lessen Israel’s dependency on the United States. There is potential for this to happen, as Israel recently decided to cancel its drone sale to Ukraine in the midst of the crisis. The situation with Assad differs greatly. The problem with Syria is that after the fall of the Soviet Union in the 1990s, Russia neglected to support and continue the well-established links with the remaining pro-Russian political base. This was indicative during the leadership change from Hafez al-Assad to Bashar al-Assad in 2000, whereby now the Russian security services are hastily trying to revive those connections in order to cement Russia’s position in Syrian politics no matter the political outcome of the civil war. In terms of the Syrian war, Russia, along with Iran, continues to sell arms to Assad. Putin is intent on keeping Assad in power and sees no better alternative to him. A repeat of Libya, where a bloody power vacuum was created after the toppling of the regime, is a worst-case scenario for Russia, considering Syria’s proximity to its borders. Bearing in mind that there are 1,500-2000 Russian foreign fighters in Syria, of which 500 have declared allegiance to ISIS, the question of their potential return to Russia is of great seriousness. Russia’s priority in Syria is for stability in the area, in order to stem the draw for violent Jihadism, as well as allowing resources to be focused on more pressing issues, such as Ukraine. Russia takes an opportunistic stance with the war in Syria, whereby it advocates peace negotiations with all sides, whilst selling arms to Assad. It has capitalized on taking on the role of a peacekeeper. Some argue that the message sent from the Kremlin to the West is one that follows the line of ‘you need us for stability in the Middle East’, which serves as a warning against intensifying the situation in Ukraine. In fact, Russia has facilitated numerous forums, talks, and conferences between the Syrian leadership and the opposition. In the hydrocarbon sphere, Russia’s policy remains the same. That is to maximize Russian revenue from natural resource extraction and deals. Although the region is a serious challenge to Russia’s dominance of the European energy market, Russia is intent on either minimizing Middle Eastern involvement, or if unable to do so, have a stake in Middle Eastern hydrocarbon enterprises in Europe. This has been demonstrated by the activity of Russian oil companies in Iraq. Lukoil continues to work in unstable provinces, regardless of the threat of terror. During the ISIS surge in the summer of 2014, BP and ExxonMobil evacuated their personnel, whereas the Russian plant had evacuation plans but continued to operate in the West Qurna Field. Russian arms producers have increased their revenues as well, with Iraq being one of the main importers of arms. A key aim for Russia is avoiding international isolation, as is the current case with the U.S. and Europe. The Middle East provides space for this isolation to be offset, as seen in Russia’s increased agricultural trade with the region. This has mitigated the effects of the self-imposed food sanctions of August 2014 by replacing agricultural produce with imports from Iran, Israel, Turkey and Egypt. In return, Russia exports wheat, barley, and rye to Saudi Arabia, Egypt and Israel. Except for agricultural produce, Russia is mostly known for its arms sales in the region. In 2013 Russian arms sales to Syria and Egypt totaled USD$1.5 billion. In a limited sense, Russian foreign policy in the Middle East can be described as Kalashnikov diplomacy. Its policy does not have a lot of capacity and lacks a long-term goal. Much of its policies are determined by the failure of policies by the West. Furthermore, the agenda lacks any clear objective in the region. Looking at relations as a whole shows Russia’s willingness to work with anti-Western nations but its incapacity to fulfill its promises. Whether this is due to Russia not seeing the Middle East as a priority for its foreign policy or because of resource drainage in Ukraine, this predicament is here to stay. With this in mind, there is still a pattern that can be seen from Russia’s relationship with the Middle East. Firstly, Russia continues to reject military intervention by third-party players as a way to resolve internal political issues. Secondly, it supports the current borders and advocates for stability in the region. Finally, it continues to capitalize on the desire of Middle Eastern countries to have an alternative power to work with. Russia has a relatively pragmatic and flexible foreign policy regarding the Middle East, where Russia is keen on working with countries willing to cooperate, whilst upholding ‘red lines’ on regime change. It has learned from the mistake of allowing the Libyan no-fly zone morph into a NATO campaign to overthrow the Gaddafi government. It is keen on maximizing its revenues from the region whilst providing stability to the area. However, Russia lacks a concrete plan in the Middle East and seems to be improvising policy as it goes. Although useful at times, it is unsustainable both for Russia’s aim of remaining a credible international power and for stability in the region.